Can I obtain the data I require, in a timely manner, to successfully complete my research? A typical one year MSc course would allocate 3 months at the end, to complete the disseration. The gathering of company financial quantitative data, (from sources such as: Thomson Reuters Datastream, S&P Capital IQ, Bloomberg Professional, Compustat via WRDS: Wharton Research Data Service) is fundamental to the success of the research. Data is not available: It is not contained within the databases the university subscribes to. The years required are not covered. The student is off-campus and the data is only accessible on-campus (as is the case for Datastream and Bloomberg Professional). Research Proposal: This may be too ambitious. For example, a student reads an accounting/finance journal article and decides to try to replicate all or part of the research contained within the article. This can be problematic, as the academic probably spent two or more years completing the research – greater than the time available for an MSc dissertation. Topic: The choice of topic can be influenced by a desire to work in a particular area of finance. Unfortunately, this may lead to the key difficulty when conducting research – Data is Not Available. Data is the foundation on which any analysis is based. Where this is difficult to obtain, time pressures may result, leading to the possibility of failure to submit the dissertation on time. Whilst it could be argued that the difficulties experienced by students in working on their dissertation are part of the research process, as a Librarian, my approach is different: how can I be most helpful, in assisting the student to successfully complete their research? Pilot Project: Essentially this means establishing the best source – there could be more than one available. Also, how to search the source productively. Also, whether all the years of data required are covered. Seek Guidance: This follows directly from point one above. It may be that the most efficient method (shortest time to collect what is required) is not known to the student. Guidance from a Librarian can demonstrate the best source and search method, drawing on years of experience in supporting student dissertation research. Explore Resources: With so many sources available to students, the difficulty is often one of familiarity – knowing which databases are available and how they can be accessed. A Library web site is a good place to start. The example below is the subject guide for ‘Business and Management’, at the University of Manchester. Making the best use of resources by seeking guidance from Librarians and planning ahead (pilot study) can help to ensure a dissertation is successfully completed. The key factor being, the ability to secure data, on which to base any analysis. The following message is copied directly from Thomson Reuters content notification DN093509. It applies to Thomson Reuters Datastream, specifically Environmental, Social and Governance (ESG) data. There has been no change in the ASSET4 Excel template which can be used to access this data. The 2015 ASSET4 ESG data glossary (Excel format) offers an additional reference of the relevant datatypes. A copy of this message is also available as a PDF. Thirteen new ESG Scores measures have been added to Datastream. Thomson Reuters ESG Scores are an enhancement and replacement for the existing equally weighted ASSET4 ratings*. They reflect Thomson Reuters’ new strategic ESG framework. * NB: We advise all users of the ASSET4 ratings to migrate to the new ESG Scores in the coming months, as we plan to retire the ratings in early 2018. The new scores are designed to transparently and objectively measure companies’ relative ESG performance across ten themes as shown in the chart below. A combination of the ten categories makes up the ESG Score, which is discounted when there were ESG controversies to calculate the ESG Combined Score. Where there were no controversies for a particular period, the ESG Combined Score and ESG Score have the same value. The ESG Controversies score is calculated per fiscal period, with the latest controversies being reflected in the latest complete period. Thomson Reuters ESG Scores are calculated and available for all companies and historical fiscal periods in the ESG Global Coverage, consisting of 6,000+ public companies globally. Below are the corresponding Datastream datatypes, titles and definitions. TRESGS ESG Score ESG Score is an overall company score based on the self-reported information in the environmental, social and corporate governance pillars. TRESGCS ESG Combined Score ESG Combined Score is an overall company score based on the reported information in the environmental, social and corporate governance pillars (ESG Score) with an ESG Controversies overlay. TRESGCCS ESG Controversies Score ESG Controversies Score measures a company’s exposure to environmental, social and governance controversies and negative events reflected in global media. TRESGENRRS Resource Use Score Resource Use Score reflects a company’s performance and capacity to reduce the use of materials, energy or water, and to find more eco-efficient solutions by improving supply chain management. TRESGENERS Emissions Score Emissions Score measures a company’s commitment to and effectiveness in reducing environmental emission in the production and operational processes. TRESGENPIS Environmental Innovation Score Environmental Innovation Score reflects a company’s capacity to reduce the environmental costs and burdens for its customers, thereby creating new market opportunities through new environmental technologies and processes or eco-designed products. TRESGCGBDS Management Score Management Score measures a company’s commitment to and effectiveness in following best practice corporate governance principles. TRESGCGSRS Shareholders Score Shareholders Score measures a company’s effectiveness in the equal treatment of shareholders and the use of anti-takeover devices. TRESGCGVSS CSR Strategy Score CSR Strategy Score reflects a company’s practices to communicate that it incorporates the economic (financial), social and environmental dimensions in its day-to-day decision-making processes. TRESGSOWOS Workforce Score Workforce Score measures a company’s effectiveness towards job satisfaction, healthy and safe workplace, maintaining diversity and equal opportunities, and development opportunities for its workforce. TRESGSOHRS Human Rights Score Human Rights Score measures a company’s effectiveness in respecting the fundamental human rights conventions. TRESGSOCOS Community Score Community Score measures the company’s commitment to being a good citizen, protecting public health and respecting business ethics. TRESGSOPRS Product Responsibility Score Product Responsibility Score reflects a company’s capacity to produce quality goods and services, incorporating the customer’s health and safety, integrity and data privacy. For more details, you can click here to refer to the full methodology paper. In particular, you can consult page 12 for a high-level comparison between the two scoring methods. An example of nested conditional statements, taken from WRDS help pages. Wharton Research Data Service (WRDS) is praised for offering a consistent user interface across the many databases that it houses, so, when a new search feature is released, it will be available for all users. They have updated the conditional statements builder and made it more powerful and easy to use. We will look at Compustat Global in this example. What is the conditional statement builder? To quote WRDS support, you can “build unlimited conditional statements using the list of variables, comparison operators, desired values, and logical operators”. The conditional statement builder still forms part of Step 2: Apply your company codes, but you will need to come back after completing Step 3 Query variables before it will work. How do I use the conditional statement builder? 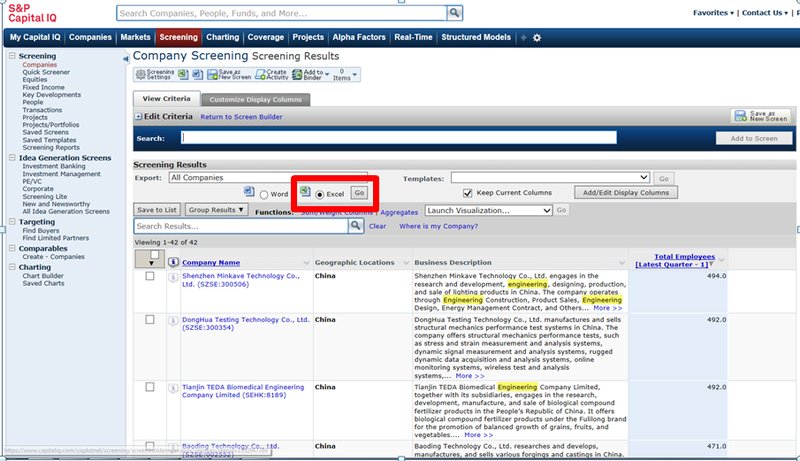 As before, you can choose to select companies individually, upload a list, or “Search the entire database”. Choose this last option if you wish to use the conditional statement builder to reduce the scope of your search using any query variable. For example, you may want to search for companies located in one country, or those with total assets over a threshold, or those in a particular sector. Note that you will need to include the relevant query variable in Step 3: Query variables before applying the conditional statement builder. Scroll back up to Step 2, click “Activate Conditional Statement Builder”. Add rules one at a time, selecting one of the chosen query variables and a condition (equals, not equals, greater than, begins with, and so on). You can choose to join with AND or OR logical operators. You can add groups of statements and join them. You must take care to use the right units, scale and codes. To check the acceptable values to use, check the Variable Descriptions tab at the top of the page, or perform a small search and look at the kind of results it gives. There is a short help page by WRDS on conditional statements, click the link labelled “How does this work?” above the builder. A request for information from an academic (or student) can appear straightforward, but may be challenging, when all the resources available are not known, or fully understood. Consequently, on receiving a request for a list of Chinese companies, in particular industries/sectors, with an employee count of between 100 and 500, a number of potential options present themselves. Namely, Thomson ONE.com, Bloomberg Professional and Capital IQ. With the primary emphasis on publicly quoted companies for the first two databases, that leaves Capital IQ, which also covers private companies. 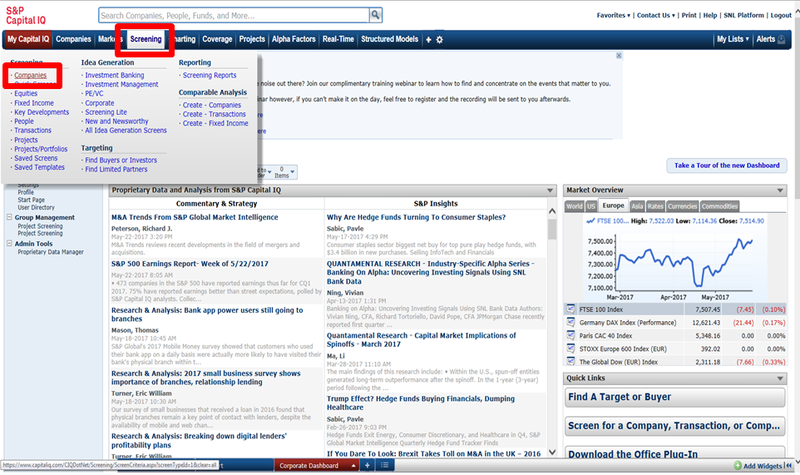 The drop down menus across the top of the search screen reveal options quickly and simply. 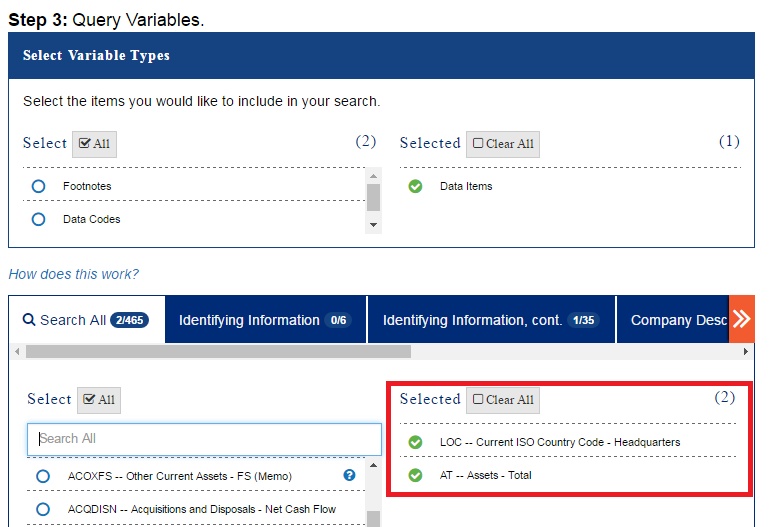 The option for searching – or screening – companies, to create a list according to the criteria specified, can be accessed by hovering over ‘Screening’, towards the top left. Once ‘Screening – Companies’ is selected, a number of standard options are presented, within ‘Most Used’ and ‘Company Details’. Certain options would appear to cover broadly similar areas. For example, ‘Geographical Locations’ and ‘Country of Incorporation’. Also ‘Industry Classifications’ and ‘Business Descriptions’. These options can be inserted into separate searches to obtain different results, to gauge which most closely matches the requirements of a research project. 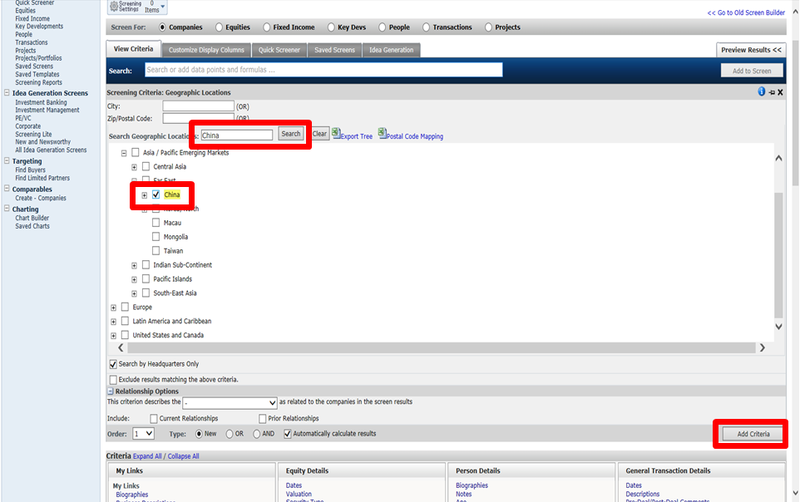 Searching for the country required: in this case ‘China’, then select from the options presented and click on ‘Add Criteria’, to begin the search process. This produces 375,994 results. 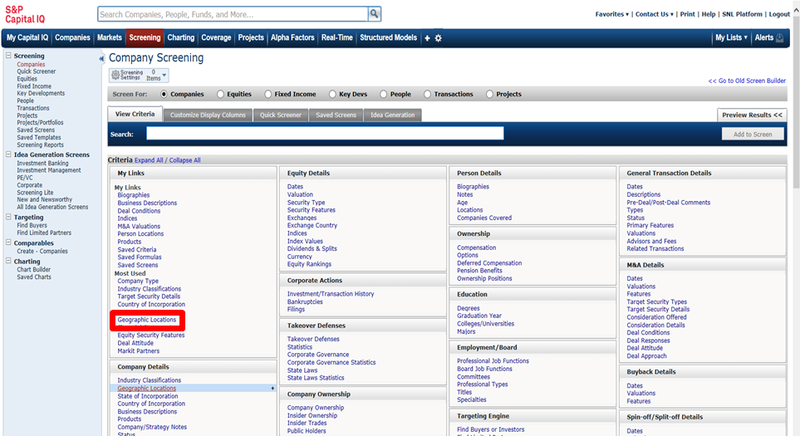 Next, Business Descriptions: search for ‘Engineering’, then click on ‘Add Criteria’. This greatly reduces the number of results as both criteria have to be true (the ADD operator in Boolean searching), giving 5,889 companies. 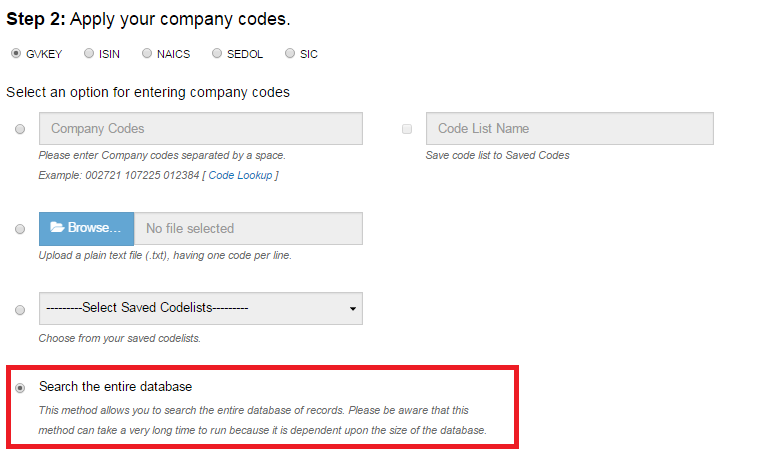 Where a required data item does not appear within the standard list, it is possible to search for possible alternatives. In this case, employees. 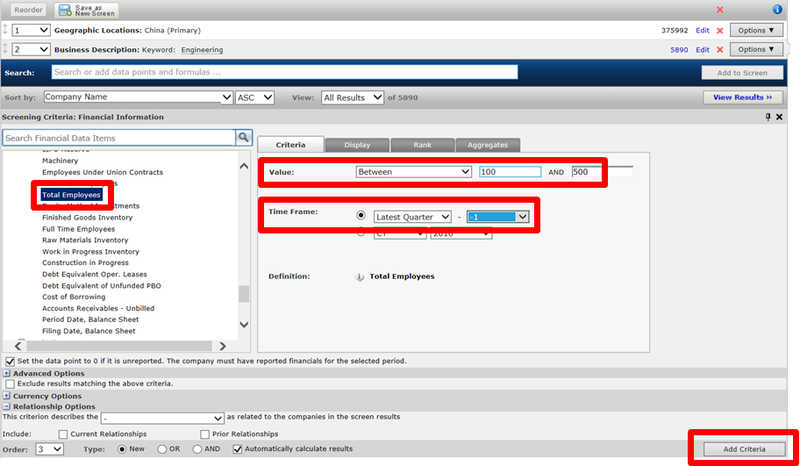 Type ‘Employees’ in the search box, hover over the required selection (‘Total Employees’) and then move along the line to select ‘Open Criterion’. The specific details can then be entered. That is, a range of between 100 and 500 employees working for companies, in the Last Quarter. Click on ‘Add Criteria’ to search. The culmination of Geographic Locations (China), Business Descriptions (Engineering) and Total Employees (100 to 500) combine to give 42 results – companies. Click on the ‘View Results’ button to list the companies. Clicking on the company name provides additional details. For export, click on the ‘Excel’ button and ‘Go’. 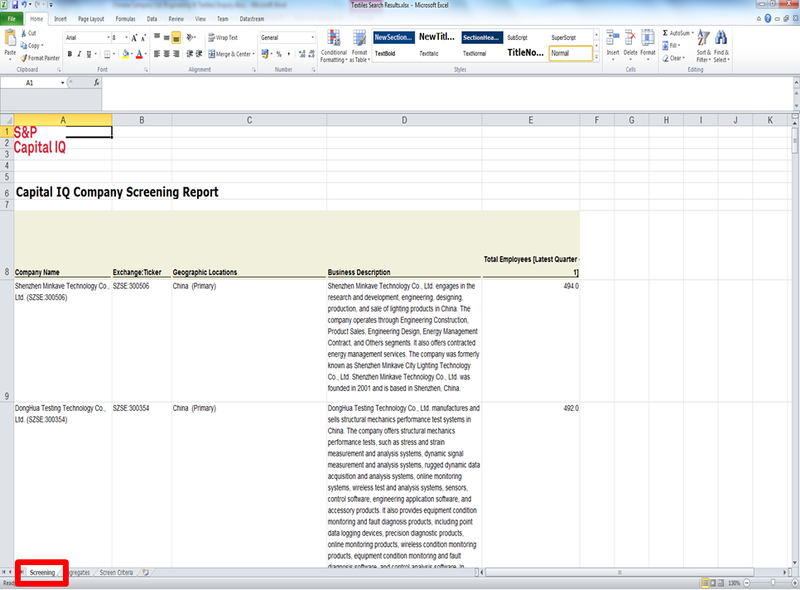 The Excel export option is straightforward, providing tabs for search results (Screening). The criteria for the search are set out in the ‘Screen Criteria’ tab. 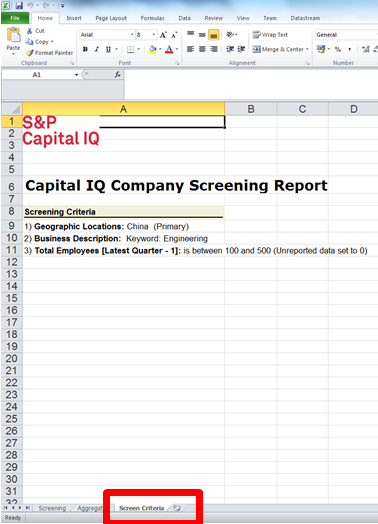 The Capital IQ Screening feature is easy to use and flexible. In terms of results, these are quick to display on screen or alternatively export to Excel. S&P Capital IQ, Bloomberg Professional and Thomson ONE.com databases are available for use by current students and staff of The University of Manchester.